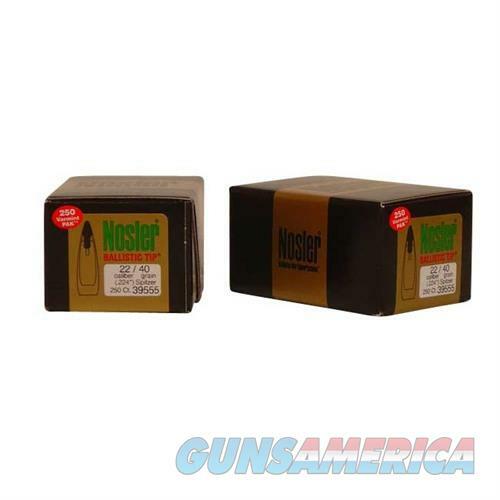 Description: Nosler, Inc. 39555 22 Caliber (0.224") 40gr Spitzer 250/Box Nosler Ballistic Tip Bullets combine the accuracy of a hollow point match bullet with the game taking performance of a Solid Base hunting bullets. The tough polycarbonate tip provides an extremely pointed nose for a higher ballistic coefficient, but it also serves to initiate expansion upon impact and protects against bullet tops damage during recoil in magazine fed rifles. 100 count box.